The Drever is a small scenthound that has been bred to hunt all sizes of game, from hare to fox to deer. They are powerful trackers and work well in rough terrain, including deep snow. Although rarely seen outside its homeland in Sweden there it is quite popular both with hunters and as a family companion. Their name is drived from the Swedish word "drev", meaning "to hunt". The history of the Drever begins in 1910 when Westphalian Dachsbrackes were imported into Sweden from Germany. These dogs we crossed with local hounds and by the 1930s they had become popular with Swedish hunters. This new strain had grown to be larger than their German ancestors and in 1947 a newspaper contest was held to select a different name for the larger type, Drever. 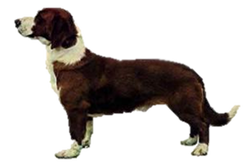 The Drever was accepted by the Swedish Kennel Club in that same year and the Fédération Cynologique Internationale (FCI) in 1953. Today there are far more Drevers worldwide than Westphalian Dachsbrackes. Is the Drever Right for You?